I was on my way up to the office about 15 minutes ago after buying some milk tea from 7-Eleven when the elevator stopped at the 2nd floor. In walked MariMar herself, Marian Rivera, looking hotter than hellfire (she was wearing a loose fitting workout shirt, tapos kita yung bra niya-- black), and she ended up standing a couple of inches in front of me. They were discussing what was gonna happen to the show, and they ended up spoiling part of the ending. But... damn. My grandfather died last week after spending a month in the ICU. Tatay had been ill for a while, and he was 78, so it wasn't really a big surprise. I had to take most of last week off to take care of stuff, just trying to make myself useful. I put in my share for the hospital and funeral bills. I shuttled from QC to Funeraria Paz in Sucat to check on the make-up (the embalmer tried to make small talk to, I dunno, cheer me up I guess?) and pick up the body and hitch a ride with the hearse to the chapel in San Pedro. I bought food to make sure the kids had lunch and dinner already and that they stayed out of everyone's way. I even baby-sat relatives who weren't on speaking terms with each other. And despite going with only a couple of hours rest each night, I made it through the week. Maybe it got a bit dusty during the funeral, but I thought I made it out ok. I was there for everyone else. Tatay would have been proud. And now I'm back in the office, and I've been kind of a basket case since yesterday. Maybe I'm just still tired and stressed out and I don't want to deal with the backlog at work and the projects for school and even the laundry at my apartment. While we're on the topic, Paul Rudd's next film has him starring in a movie with Rashida Jones. For those who don't watch The Office, Rashida played Jim's new girlfriend Karen Filippelli in the third season of the show. She won quite a few hearts (including mine) and threw a wrench into the show's main PB&J romance. The first one is with Paul Rudd, where she will play the female lead. The movie is entitled, “I Love You, Man” and it also stars Jason Segal (from How I Met Your Mother). It’s a story about a man who is bound for the altar and seeks out a best man for the wedding. Rashida Jones is also set to shoot, “Chill” with Renée Zellweger and Harry Connick Jr. She will play best friend to Zellweger’s character, a big-city businesswoman who has to move to a rural town in Minnesota. Her upcoming TV Series, Unhitched, on the Fox network is expected to premiere this year, too. A couple of months ago, I wrote about an Amy Heckerling-movie whose poster I saw at Megamall, and I wondered why it wasn't widely distributed in the US when it first came out. I never got around to seeing the movie (although I did see the trailer a couple of times on TV), and I promptly forgot all about it. Today's AV Club features Nathan Rabin (in his awesome My Year of Flops series) discussing the movie. He rates each movie as a failure, a fiasco, or a secret success, a system he based on the opening lines from Cameron Crowe's Elizabethtown, which happened to be the first film reviewed for the series. Surprisingly, Rabin actually liked the movie, giving it a secret success rating, despite Heckerling's directing being all over the place. He raved about the acting, particularly the lead stars Paul Rudd and Michelle Pfeiffer, and the supporting guys Jon Lovitz and Fred Willard (who's always awesome). Like me, he also wonders why Rudd isn't a much bigger star than he is, when people like Seth Rogen and Jonah Hill are blowing up. Anyway, the whole thing made me curious (again) about the film. I'll be looking for it on my next trip to Quiapo. Jennifer Grant, a product marketing manager at Google, says that the survey suggests men are more comfortable than women in sending certain personal messages over e-mail. Men, for example, are more likely to have asked someone on a date over e-mail -- 26 percent versus 16 percent of women -- and to have broken up over e-mail. A third of male respondents consider break-up e-mails OK e-mail etiquette, while only a one-seventh of female respondents thought so. Men were also more likely than women to have sent regrettable e-mail messages while drunk. Women, though, were more likely to send chain e-mail forwards. The <S> Marks the Spot album launch last night was awesome. The band rocked the Sunken Garden with a pretty long set, and despite the dryness of the evening (no beer for sale! ), the crowd was hot. Mark Abaya even made a cameo for Butterfly Carnival and Two Trick Pony, although Jam booed him (I'm not a big fan either, but it was alright). I cracked up when the kids in front of us quipped, "Uy, si Mark Andaya!" Oh, and the new album... it's probably the best OPM album you can buy this year. We've been waiting for this for a while, because we've turned into Sandwich geeks from watching them all the time at the Bistro (we know most of the songs already! ), and because there hasn't been a good OPM album in a while. (Seriously, the last rock awards had Bamboo as band of the year and the worst OnL album as album of the year.) We even ended up buying band t-shirts, which were cool because it had the list of bands that played that evening, like a tour shirt. Actually, the album was much better than we expected. Apart from the great new songs (check out Text in the City), it includes a bonus disc that has their unreleased material from the past few years (Zaido!) and remixes of their old hits. My favorite is the slow-jam version of Walang Kadala-dala that they always used to play at the Bistro. I'm off to the UP Fair now for the launch of the new Sandwich album. Yeah! 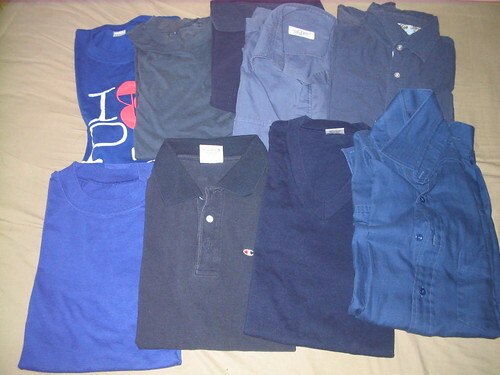 I was folding laundry the other day when I noticed that a ridiculous number of my shirts were the same color (this isn't even all of it; I've got a bunch of them in my next laundry pile). This probably doesn't amount to much, but if you asked my mom, she'll probably tell you this is one of the reasons I'm still single. We were in Tagaytay this weekend for Paul and Jona's wedding. Of course weddings are already generally happy occasions, but it was awesome because there were a lot of us Pisay people present. Mimi and Karl also did the photography, with ample assistance from Markku, so there were familiar faces all around. We arrived late for the wedding (it was Leks's fault). We got in as the ceremony was ending and it was time to take photos. At least we made it to the photos. Apart from everything else, I liked the music choices they went with. The bride and groom are big fans of Ben Folds, and the Folds ballad The Luckiest played as soon as the ceremony was over. They also used Such Great Heights for an audio-visual presentation later that evening. I think I also heard The Cure's In Between Days during the introduction by the entourage, but I'm not sure. Afterwards, I ended up playing Magic, another Ben Folds Five ballad. I once thought it was a love song, but it was really about a loved one who has been battling a fatal illness before finally succumbing. The narrator takes comfort with the fact that the loved one is not really gone, but is now the magic that holds the sky up from the ground. In The Girls' Guide to Hunting and Fishing, the main character's old ex-boyfriend tells her that Dante defines hell as proximity without intimacy. I've done a little digging, and I don't know if it was really Dante, or if Melissa Bank just made it all up. Still, it doesn't make it any less true. Hell *is* proximity without intimacy. I started coming to terms with the Shaq-to-Phoenix trade, the way that Freedarko's Bethlehem Shoals in this post and after the double-OT thriller against the Hornets yesterday. Also, Shaq supposedly called Nash the day before the trade to tell him that he won't let him down. There's a very cool interview with John Cleese over at the AV Club. This is such an un-geeky thing to say, but I agree with him that Life of Brian is much funnier than Holy Grail. Brian is cry out loud funny. Robert Smigel, the former Late Night with Conan O'Brien headwriter and the man behind Triumph the Insult Comic Dog, was also behind the Ambiguously Gay Duo (from The Dana Carvey Show and, later and more popularly, Saturday Night Live). The voices for Ace and Gary were provided by Steve Carell and Stephen Colbert, who moonlighted as reporters on The Daily Show with Jon Stewart. Triumph the Insult Comic Dog has also made an appearance on Jon Stewart's show. Colbert and Conan taped a bit last year that parodied Fox News blowhard Bill O'Reilly's appearance on The Late Show with David Letterman, where the argument between the two men got animated. Colbert and Conan's segment got heated as well, and Conan ended up shooting Colbert. In the heart. Conan O'Brien started out as a writer for Saturday Night Live, working with comedians such as Adam Sandler and Jim Breuer. Before blowing up on his late night gig, Jon Stewart starred in Sandler's Big Daddy and Breuer's Half-Baked. Emerging comedian Dmitri Martin, who gained popularity as the Gen-X correspondent on The Daily Show and is now working on his own show, first made a name while he was a staff writer for Conan O'Brien. UPDATE: The feud escalates. I mean, it got out of hand really fast. I think they'll be showing this on JackTV tonight.